What is an ACS (Ambulatory Surgery Center) and why is it important to our community? "As a surgeon who has been in practice for 15 years, I've built my career around ensuring patients receive high-quality care and the best possible clinical outcomes." 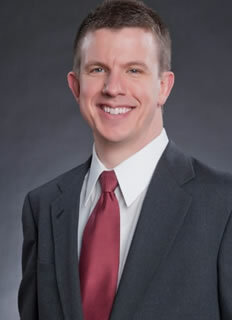 said board certified general surgeon, Dr. Erik Grossman "I believe this level of service, for many patients, is often best delivered through outpatient surgery in an Ambulatory Surgical Center (ASC)." This is the number one reason the surgeons at Columbia Surgical Associates initiated a community surgery center. In the ASC setting, physicians are able to schedule procedures more conveniently, assemble teams of specially trained and highly skilled staff, ensure that the equipment and supplies being used are best suited to their techniques, and design facilities tailored to their specialties and to the specific needs of their patients. Simply stated, physicians are striving for, and have found in ASCs, professional autonomy over their work environment and over the quality of care that has not been available to them in hospitals. It's important to note that not all patients or procedures qualify for an outpatient surgery. Those patients with pre-existing serious health issues, or needing complex procedures, are sometimes better served by receiving the surgery in a hospital setting that can accommodate an extended patient stay or specific conditions. For these patients, the hospital may be the place to deliver the best medical care and outcome. Surgeries are often shorter, recovery is faster, and the infection rate is considerably less than that of hospitals when surgeries are performed in an outpatient surgery center. The ASC Quality Collaboration is committed to developing meaningful quality measures for the ASC setting. 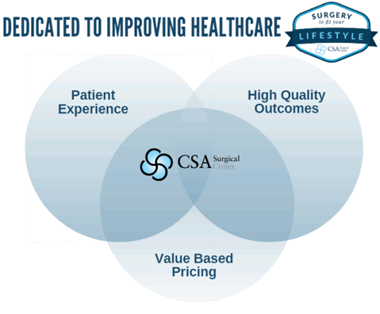 CSA surgery center recognized as patient quality improvement for post-operative patient care. Outpatient surgical centers can be 45-60% less expensive than hospitals, which provides significant savings to patients, insurers and taxpayers. In fact, the Department of Health and Human Services estimates annual savings of $15 billion for taxpayers and $3 billion for Medicare patients if all qualifying surgeries were simply performed in an ASC instead of the hospital. Yet, as noted above, these cost savings typically come with equal or improved quality of care. There's no difference in physician training, as the surgeons have credentials to perform the same procedure in both hospital and outpatient settings. The price difference is simply due to the lean structure of an ambulatory surgery center and their increased efficiency. ASCs do not have the challenge of operating 24/7 and needing to handle any type of illness, surgery or emergency that may arise. As a result, surgery centers are highly specialized and nimble. Your scheduled surgery is very unlikely to be delayed due to an emergency, and the staff member who contacts you in advance of your appointment will likely see you the day you come in and also be the one on the phone calling you in follow up during your recovery. Because of these factors, ASCs can ensure that you receive highly personalized service and the best possible experience. With a solid track record of performance in patient satisfaction, safety, quality and cost management, CSA Surgical Center is proud to announce we've received above the national average scores in regard to would you recommend the facility, confidence in care received, nursing staff and surgeon courtesy, and continues to improve upon their own scores from quarter to quarter. For more information on patient satisfaction scores. If you are planning for an upcoming surgery, and your physician says you are qualified for an ambulatory surgical center, please call CSA Surgical Center at 573-777-3370. We are open from 6:30 a.m. to 5:00 p.m. Monday-Friday. For more information on how to lower your out of pocket healthcare costs.